Viewing the granite top kitchen counter to the right and the adjoining family gathering area ahead. As you enter the unit, the family gathering area invites you ahead. The spacious balcony area is beyond. Large dining table to the left. Another view of gathering area featuring shiny wood floors. Large balcony to the left. Near balcony entrance to the rear, the gathering area says, "come and relax". Spacious living area from entrance view. Relax in comfort. Watch your game, enjoy. The well equipped kitchen, with plenty of room at the bar. Entry way to Master bedroom ahead. Dining table to the right. Another view of sparkling kitchen. The large dining table welcomes a full group to enjoy snacks, or meals. Now that's a balcony rest space for sure! At the end of the balcony looking back to the outdoor bar at the other end. A closer look at the spacious balcony area. Doesn't it just say...."come, sit with me and let's discuss all the fun of today." The master suite fit for a king. 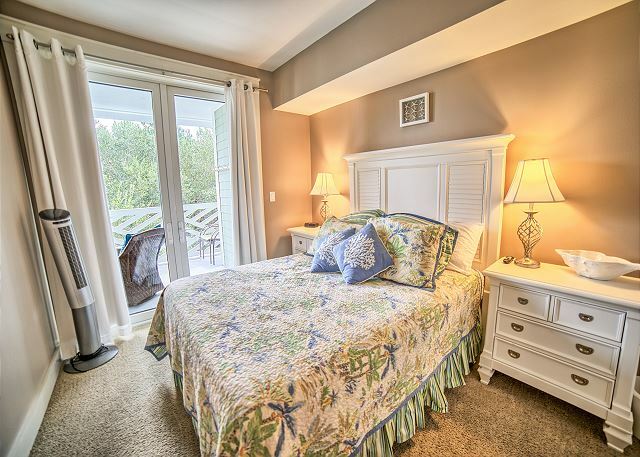 The master suite with balcony access straight ahead. 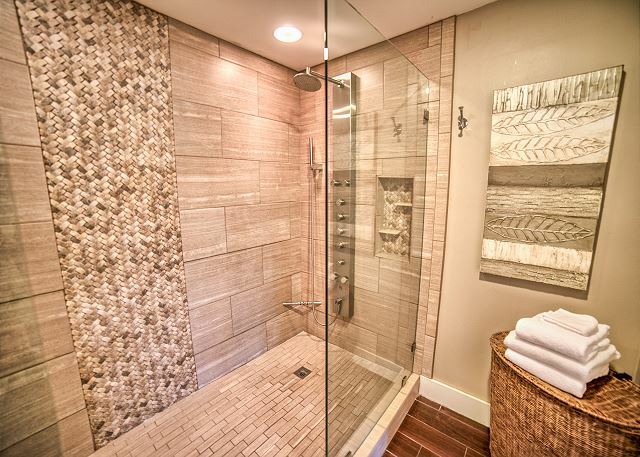 Master bath huge wall to wall shower with 2 shower heads. Master bath double sinks, shower ahead to left. 2nd bedroom with queen sized comfort. 2nd bedroom with balcony access. 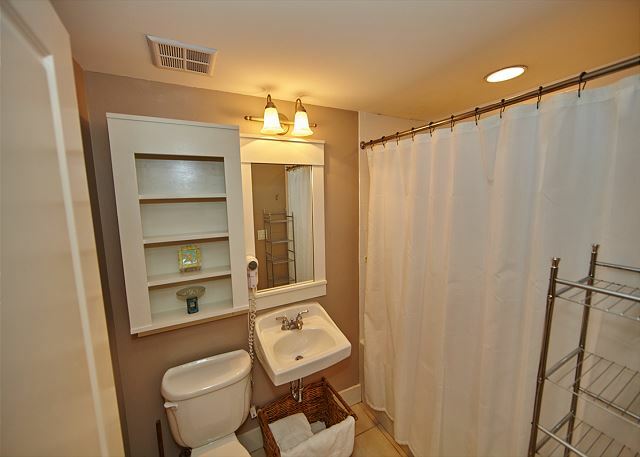 2nd bathroom with walk in shower across from 2nd bedroom. 3rd bedroom with two queens, separate entrance, small mini bar with frigette, separate bathroom. 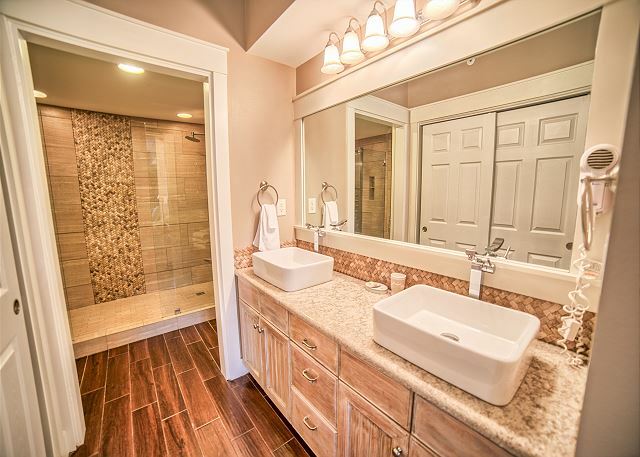 Bath, with tub/shower combo, in 3rd bedroom suite. Take the tram to the sugar sand beach. Separate spa in pool area. Work-out gym room adjoins pool/spa area. BOOK A FEW DAYS, A WEEK, A MONTH! 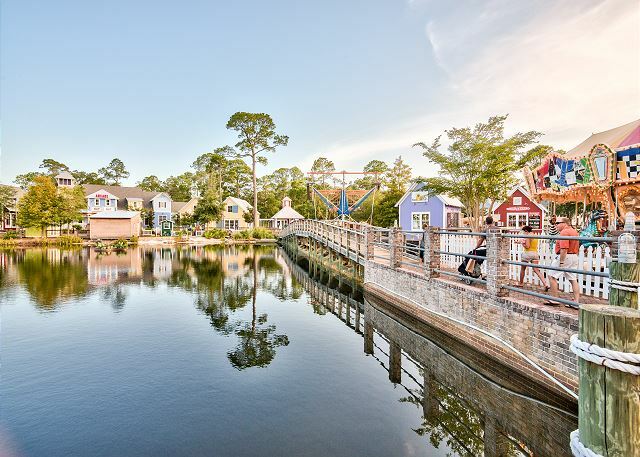 Enjoy one of the best kept secrets in the Village of Baytowne Wharf - our spacious 3 bedroom/3 bath lock-off in Pilot House contains 1413 square feet. 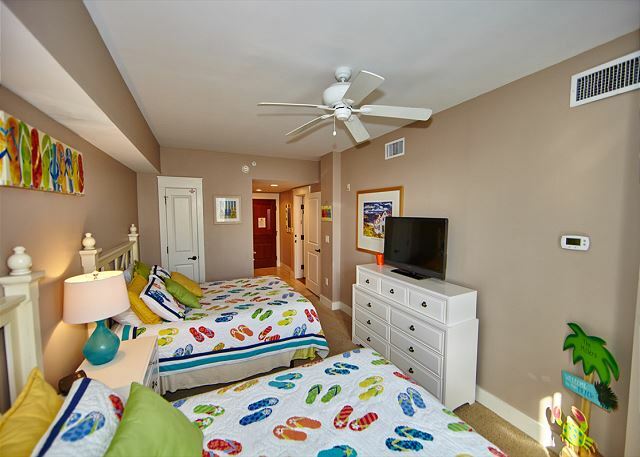 This 4th floor property with 'lock off' is perfect for vacationing with family or friends. The living area with an open floorplan is great for everyone to gather. It has a full kitchen on one side and a kitchenette in the 3rd bedroom/studio lock off. The bedrooms have been updated with bright beautiful bedding. 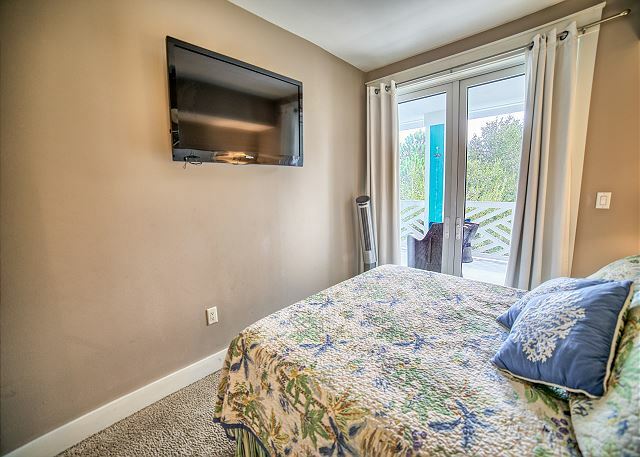 The units have separate entry doors and yet have a connecting door between the 2 bedroom unit and the 3rd bedroom/studio . The main unit has an open living space with full kitchen, dining area, two bedrooms and living room. 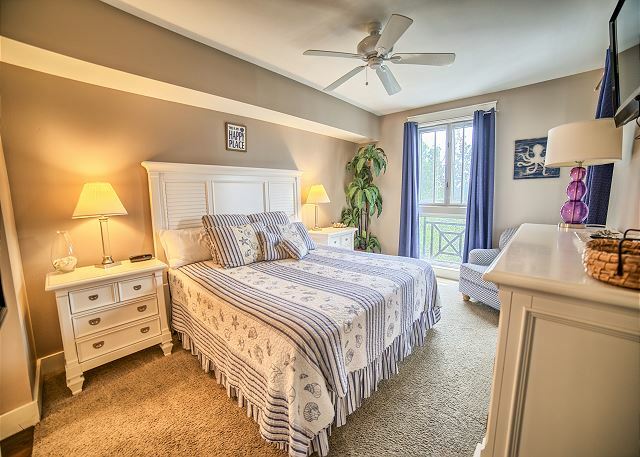 The bedrooms offer a king bed in the master and a queen bed in the second bedroom. 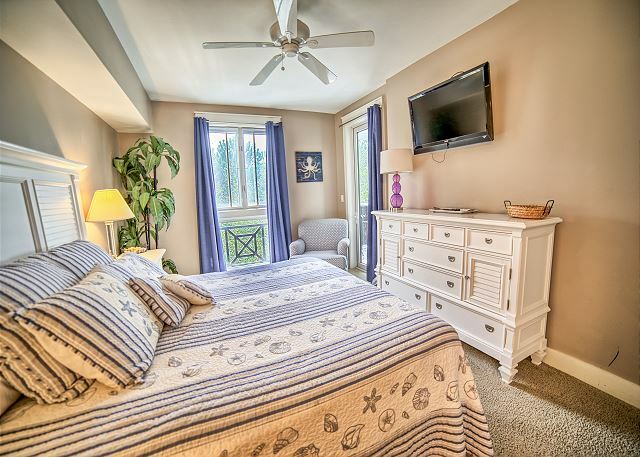 The lock-off portion is a studio and has two queen beds with a kitchenette and a full bath. 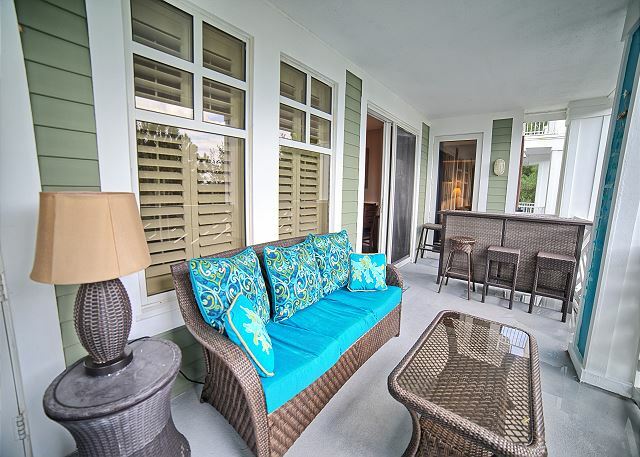 Go out on the balcony and enjoy the bar that the owner added with a fabulous couch and 2 chairs in your sitting area to enjoy the peace of your vacation. The Pilot House has a delightful pool area with hot tub and children's pool. In addition, grilling is available poolside. 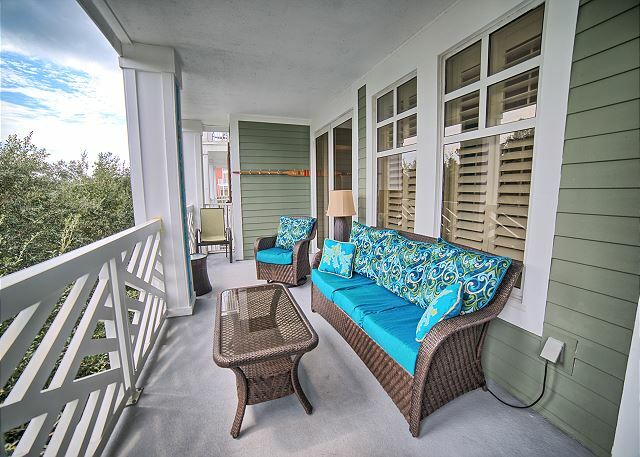 This unit is located in the heart of Sandestin in the fabulous Village of Baytowne Wharf. The village features more than a dozen dining establishments, multiple shops, daily live entertainment, playground, zip line and more. There are also events in the common area including concerts, and movies on the lawn. The stay at this property was perfect for my family. the location is great and the property was very clean and comfortable. Love love love!!!! Great family condo trip!!!! This condo is fabulous! For a large family of 8 (6 teenagers plus parents), it had great space. We had enough room to spread out so everyone had their own area. The kitchen was well stocked, which was great since we cooked the entire time we were there. 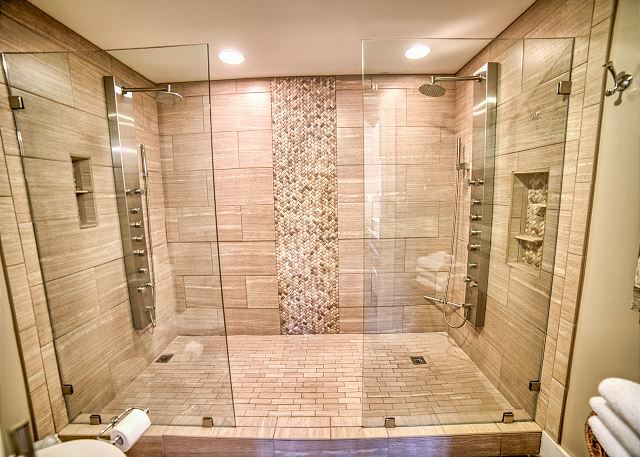 The master bathroom is awesome, double shower with full body jets! The balcony was a peaceful escape from our crazy crew and nicely furnished as well. The condo was truly fantastic and would highly recommend. The best feature on top of everything was Bette, the rep from Destin Memories. She was patient with my questions and very responsive to our numerous emails. Wonderful customer service!!!! 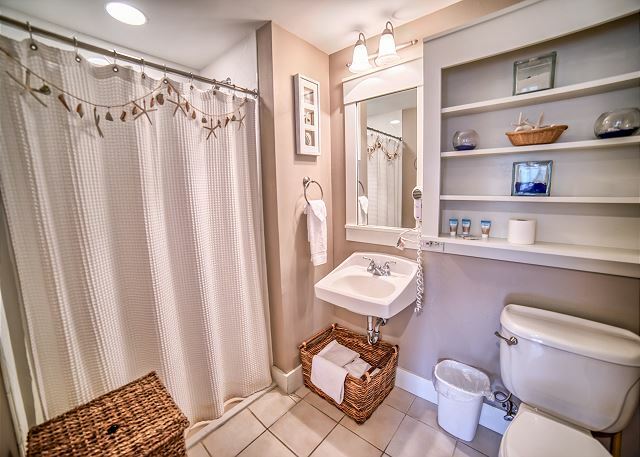 wonderful stay - this condo has it all. Thank you Bette for all your help! We had a great time. My family arrived at the Pilot House to find everything as promised. Amazing property. It was close to the wedding that we were attending. We are so happy we chose 407-409 Pilot house for our vacation. Thank you! The condo was beautiful and clean. This was a great place to stay. I will be calling them for our next vacation in the future. Great Place! Need to get with HOA about spraying for Palmetto Bugs on Porch...BAD! We had to buy Raid. Inside small brown roaches too, bagged one and left it on counter so you could see what kind. Room overall was very clean, furniture clean and well maintained. Would stay again. And bug issue has been addressed. We have had an abundance of rain which drains bugs inside. Very nice and comfortable location. Very convenient. Was able to cook breakfast for 8 everymorning with no problem. Some cookware has seen it days. Would advise replacing. Master bedroom did not get as cool as the rest of the unit. Overall, would come back and stay again. Brandon, obviously you did enjoy your stay since you would come back. We look forward to seeing you again. We have stayed in many Pilot House condos and this was by far the most spacious with 3 rooms and 3 baths. We usually stay on the side facing the pool and this unit did not, however it was quiet and peaceful. 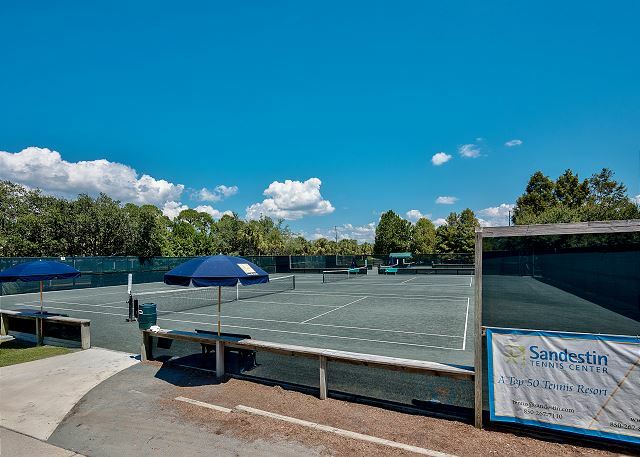 This unit offers accessibility to all of the fun activities that Baytown offers. Overall we were very impressed. 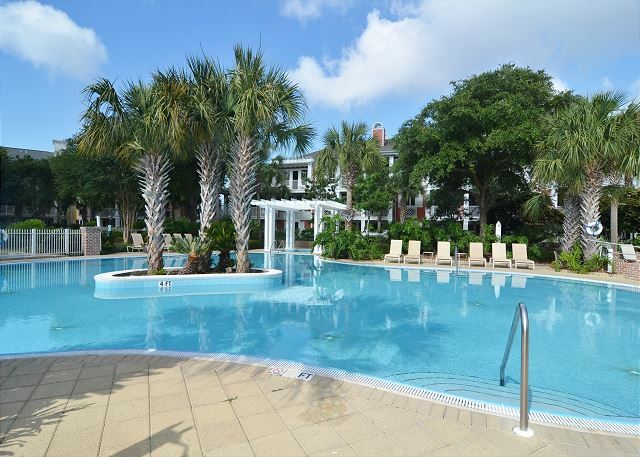 We visit Destin frequently and I've rented directly from owners and numerous rental companies. My experience with Destin Memories was absolutely fantastic! From the moment we booked until the time we left. I'd have to say, it was the easiest rental experience I've ever come across! The condo was just as pictured and it was perfect for our family. I will absolutely rent this unit again and will reach out to Destin Memories for any future bookings. Thank you so much for seeing our efforts! That is absolutely wonderful news. What a beautiful place! Our family of 7 (3 couples and one grand) had a great time. Very spacious - each couple had their own bedroom/bathroom, the kitchen was completely stocked w/glasses, dishes, cookware and utensils, unit is very close to everything, but very quiet so you feel secluded. The pool/hot tub was one floor down, and a beautiful layout w/plenty of chairs and areas of shade. Walking distance to so many shops, restaurants, carousel and playground, and the tram took us beachside to play putt putt. Owners were great to work with and have very honest cleaning crew. I forgot my purse in a cabinet, and it could easily have 'disappeared' forever, but the cleaning crew immediately contacted the owner and he shipped it back to me. We will definitely be returning. Acme Oyster House & Broken Egg Cafe never disappoint, but we found a real gem at Hartell's Village Diner - Best burgers around, and the shoestring fries & chocolate shake were excellent. We had a nice dinner at Marlin Grill and the food/service was superb. Can't wait to return to Baytowne! We are thankful you can see the advantages of the quiet surroundings. 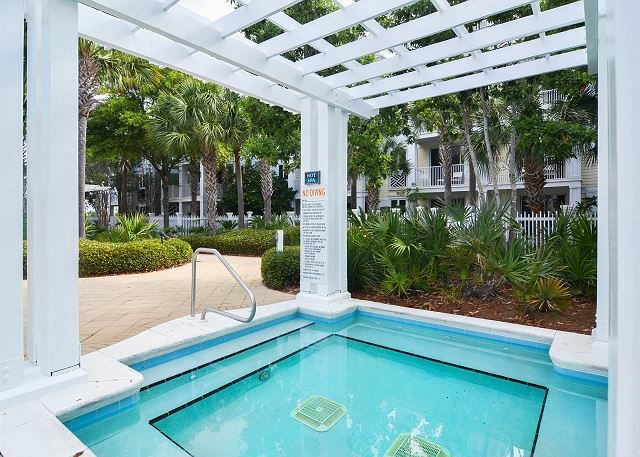 As you noted, the unit is awesome, fabulous pool area on the 3rd floor and right at the front of Baytowne Wharf Village. Perfect. Overall, we enjoyed the property greatly. My only recommendation would be to consider supplying dish soap, wash cloths and cleaning spray so we could keep the kitchen clean throughout our stay. We brought you dish soap and other items you asked for. Thus, I am not sure why the review. This was a perfect place to stay for 8 people. We had a great time. We were within walking distance to everything we wanted or needed. The coffee shop downstairs was an added bonus! Everything was very clean and comfortable. Extremely quiet and quaint. Come back often. We are thankful you enjoyed your stay and see what a great unit this is! Perfect location for a wonderful vacation! Our stay in the Pilot House was absolutely wonderful! The location could not have been better. 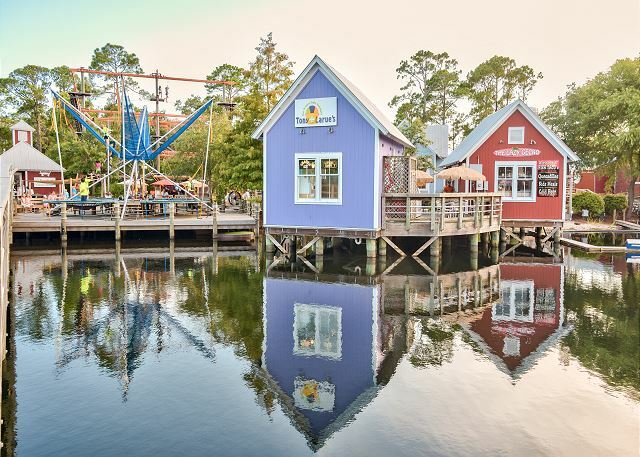 It is located right in the Baytowne Wharf Village and you can walk down to amazing restaurants, activities for the kids, and great shops. The room was very clean and fit the seven of us very comfortably. I gave 4 stars for the condition of the property because the barn door on the master bath was off its track, but the manager is aware (responded within minutes) and is working on getting it fixed. We look forward to staying here again in the future!